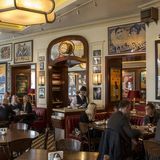 "Inspired by the great French pavement cafés, Colbert is an informal, neighbourhood rendez-vous at the heart of Sloane Square; it opens early for breakfast and continues to serve food and drinks throughout the day until post-theatre." What did you think of Colbert Chelsea? Requested a quick service as we were going to a classic rock show at the Cadogan Hall, meal was excellent and with fast quality service, many thanks and the show was great. Good food. Bad service. Reckon front of house should be sent off to training! Really not acceptable, not anywhere, but especially in a place that position itself as upmarket with prices to match. Parisian chic has well and truly landed in the heart of Chelsea courtesy of this fine new spot from the guys behind The Wolseley. 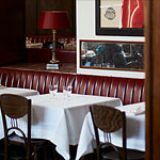 Sitting on the old site of the longstanding Oriel, and opened by Corbin and King (The Wolseley, The Delaunay, Brasserie Zedel), comes this perfectly-pitched new venture. 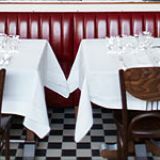 Modeled on the boulevard-style, all-day cafés of Paris, this is one beautiful restaurant. Sloane Square itself is an impressive part of London so Colbert's elegant frontage always had to be eye-catching, and that it most certainly is. Large red canopies bearing the name hang down low over the pretty outdoor chairs and tables that rest on the pavement, and above, 'Colbert' appears to have been carved into the very masonry itself, offering a sense of permanence that’s almost arrogant in its assumption that it will be a success. 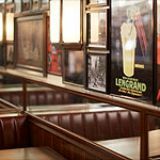 Inside, it’s pure elegance with French posters covering the walls and dark red and brown leather booth seating almost giving a gentleman's club nod. It’s countered by feminine swirls on the patterned carpet and bold black and white tiling. Anyone who has been to New York’s Campbell’s Apartment at Grand Central Station will see something of NYC’s speakeasy culture also slipping into the décor. Colbert Chelsea’s concept of all day café dining is perfectly pitched for a recession-hit, miserable London. It means you can throw your cares to the wind and eat whatever you want, whenever you want. Fancy heading to a fancy restaurant to eat a crispy bacon roll at 10pm? No problem. It’s utterly refreshing and incredibly smart. In a typical dinner dining format it would be prohibitively expensive for most people; instead, the skew towards brunch style dishes all day makes it affordable for many looking to enjoy the ambience of this fantastic new spot. And the staff don’t emulate the Parisian attitude, either, with friendly smiles mixing with faultless dedication to restaurant etiquette - something that certainly bodes well for the future, given it's still in a soft opening period. The only restriction on the all-day menu is on dishes such as oatmeal and compotes, which finish at midday. Otherwise, it’s what you want, when you want, however you want it, meaning you can enjoy the ambience of this beautiful restaurant without forking out for a three course dinner. The prices really are incredibly good. For example, a croque-monsieur (cheese and ham sarnie to you and me) costs just £5.95 – only slightly more than you’d get for a pre-packaged sandwich in M&S. If you really want to blow the budget you’ll actually find it quite tricky. 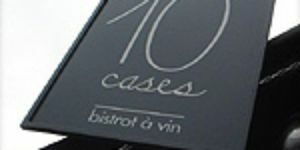 There are only a few main course dishes, the most expensive of which is the côte de veau rôti (veal chops) for £36. Otherwise, the dishes won’t leave you wincing – far from it. The restaurant is already gaining a reputation for skill with egg dishes and as any good bruncher knows this is the way forward. The scrambled eggs with smoked salmon (£8.50) is an absolute delight, being slightly soft and perfectly creamy with some brilliantly spot-on seasoning. The generous slivers of smoked salmon offer a delightful textural sensation, bringing a pleasant saltiness to the creamy, light eggs. It’s also a good way of adding some decadence to brunch without going all out with the scrambled eggs with black truffles (£27.50). Whereas the salmon adds saltiness, the truffle – which is incredible quality even for the higher price – adds an incredibly deep earthiness for an unusual take on the mid-morning favourite. Of course, you should make the most of the French love of pastries and it’s worth getting in before 6pm so you can enjoy their marvellous pain au chocolat (£3.50). The pastry is fresh and crumbly and the chocolate – oh the chocolate… gooey, decadent, not too sweet, it’s chocolate as the French do. Of course, the French love their wine and in keeping with our friends over the Channel there’s a well-sized wine menu of entirely French bottles from which to choose. Priced from just under £20 to £285 there’s a considerable range of price points. There is also a large number available by the glass so you don’t have to get smashed at lunchtime to enjoy a tipple. However, if you’re opting for an easygoing brunch then stick with the amazing coffee – Starbucks, eat your heart out. When the upcoming opening of Colbert was announced everyone expected it was going to be something special. 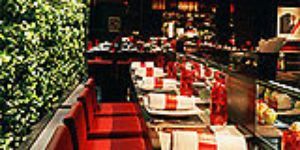 What they may not have expected was a fine dining food experience made affordable to all with a clever all day menu offering flexibility on both what you fancy eating and how much you want to spend. This place is definitely recommended.